Recyclables and compostables are not allowed in the trash in San Francisco, which goes directly to a landfill. Materials in your blue bin are made into new bottles, cans, and other products. Food, soiled-paper and plants in your green bin are composted into nutrient-rich soil used by local farms. Since October 2009 Mandatory Recycling and Composting requires everyone in San Francisco to separate their refuse into recyclables, compostables and trash. 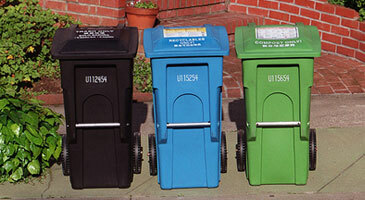 Every event held in San Francisco is required to offer recycling and composting at the event. We offer special assistance and signage to help events comply with San Francisco's Mandatory Composting and Recycling Ordinance. San Francisco City and County employees are leaders in environmental protection and are helping achieve our goal of zero waste by 2020. We offer free tools to help our city employees prevent waste, reuse, recycle, compost, and buy green to conserve resources and save money.